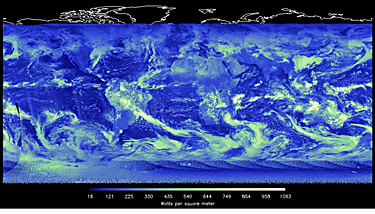 The Clouds and the Earth's Radiant Energy System Flight Model 6 (CERES FM6), developed by Northrop Grumman and managed by NASA's Langley Research Center in Hampton, Virginia, is scheduled to launch on November 10 aboard the National Oceanic and Atmospheric Administration's Joint Polar Satellite System-1 (JPSS-1) from Vandenberg Air Force Base in California. CERES first images show heat energy radiated in shades of yellow, red, blue and white. The brightest-yellow areas are the hottest and are emitting the most energy out to space, while the dark blue areas and the bright white clouds are much colder, emitting the least energy. Increasing temperature, decreasing water vapor, and decreasing clouds will all tend to increase the ability of Earth to shed heat out to space. Image is courtesy NASA Langley Research Center. Global CERES data allow scientists to validate models that calculate the effect of clouds on planetary heating or cooling. Those data also help improve seasonal climate forecasts, including cloud and radiative aspects of large-scale climate events like El Niño and La Niña. In addition, CERES data can be used for assessing the radiative effects and climatic impact of natural disasters like volcanic eruptions, major floods and droughts. For 32 years, Langley instruments have provided stewardship of critical climate observations both through CERES and the Earth Radiation Budget Experiment (ERBE), which began measurements in 1984. Five CERES instruments already are on orbit aboard three satellites. CERES FM1 and FM2 launched in 1999 on the Terra satellite. CERES FM3 and FM4 launched in 2002 on the Aqua satellite. CERES FM5 launched in 2011 on the Suomi NPP satellite. A CERES instrument that launched on the TRMM satellite in 1997 stopped collecting data in 2000. CERES provides critical observations of how solar energy absorbed and terrestrial infrared radiative energy emitted by Earth are distributed over the planet, thereby helping to improve seasonal weather and long-term climate predictions, according to Norman Loeb, principal investigator for NASA's Radiation Budget Science Project. He added that CERES FM6 will extend the existing CERES record, helping to quantify decadal changes in Earth's energy budget and clouds, and improve understanding of the mechanisms that drive those changes. CERES Project Scientist Kory Priestley noted that this final instrument from a program that has spanned more than 20 years represents the culmination of a long and fruitful partnership with Northrop Grumman in designing, building, and operating the CERES instruments. NASA fully expects the FM-6 instrument to function as well as its predecessors, providing critical observations that benefit humanity for another 10 to 15 years.